Some time ago, a popular song included the words “every new beginning is some other beginning’s end.” For some reason those words resonate in your mind, much the way a song sticks in your head, and you wish that it would pass from memory. On the surface, it could seem like a nonsensical riddle. What do you mean a new beginning is another beginning’s end? But when you think of the work Hospice bereavement specialists do with grieving individuals, the meaning becomes deeper. An individual coping with a loss, in truth, faces a changed world. The questions, ‘Who am I?’ and ‘What will I become?’ will be framed in the coming months. My family and world have changed, and therefore, I am changed. Our identities and the roles we play in our lives are altered, and we seek balance or a foundation on which to stand. But what changes will you embrace and what will you leave behind? Many individuals begin this journey facing their losses with fear and loneliness only to come out on the other side with grace, wisdom and courage to live the rest of their lives with gifts that had previously been unexplored. Story: There was a woman, who prior to her husband’s death, relied on his strength to meet all of life’s challenges. She viewed life as something she should be protected from and challenges as battles others must wage for her. After his death, she found her own inner strength, which she always possessed, and blossomed to become the person others relied upon. Her strength and growth were possible because of her loss. Her sensitivity and nurturing of others were borne out of her own pain. Our lives are filled with people who, facing challenges, find opportunities. Right now, your pain may feel intense and the words above may seem hollow or impossible to adopt—hang on. Often when faced with challenges and pain, we do not see the opportunities, blessings or gifts that lie ahead or within us. Patience is required at this time. Rachel Naomi Remen writes in “My Grandfather’s Blessings” that our blessings encircle us like planes at an airport waiting for permission to land. Her belief is that we are surrounded by blessings, but we may not be in a place to accept or recognize them. So, they will patiently wait for our eyes and hearts to open and embrace them in our lives. Our blessings surround us, but we need to be open to their presence. Be patient as you heal from your loss and remember that your blessings are circling and will land when the time is right for you to embrace them. For now, we wish you peace. 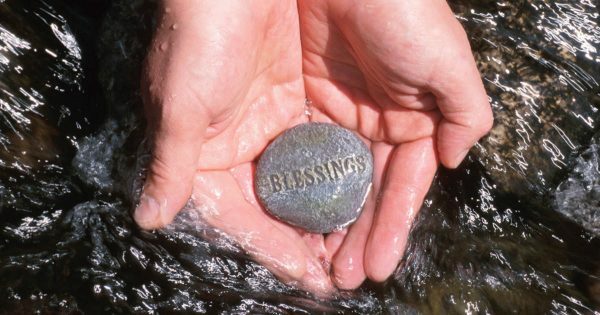 Click to download and print the Blessings article.